So here I am again, your “new” Old Crypt Keeper, whistling past the graveyard once more to bring you some chilling tales from out of the vaults of comics past. Having spoken about the late, lamented E.C. and their troubles with the Comics Code Authority, let’s take a leap forward in time to the Marvel Age of Comics, and their “re-animation” of horror in four-color graphic fiction. Marvel would test the fetid waters of horror with the introduction of Morbius, the Living Vampire in Amazing Spider-Man #101 (Oct. 1971), with the undead in the sci-fi trappings of super-hero comics, followed quickly by the more traditional “Werewolf by Night” in Marvel Spotlight #2 in February of 1972 , but it was with Tomb of Dracula #1 (4/72) that Marvel would truly hit the over-turned ground running, though it would take a half-dozen issues (…and three initial writers!) before settling into a goodly-paced shamble. The lead character in TOD is the Dracula of Bram Stoker’s work, although as the series went on, Dracula would begin to diverge a bit, taking on the back-story of Vlad the Impaler, for instance. His major antagonists are also rooted in the literary, as he’s stalked (and staked!) by the wheelchair-bound Quincy Harker, son of Mina & Jonathan Harker, and Rachel Van Helsing, grand-daughter of Professor Abraham Van Helsing. The first issue, written by Gerry Conway, and drawn brilliantly by the inimitable “Gentleman” Gene Colan (much more on him later! ), begins with a lovely call-back to the 1931 Todd Browning/Bela Lugosi film, with a night-time carriage ride through a rain-soaked Transylvanian evening, and a visit to Castle Dracula. The unwary Frank Drake, descendant of the (he assumes) legendary Count, along with two companions, has ideas about turning the castle into a tourist attraction. When his friend Clifton Graves finds a coffin with a tuxedo-clad, staked-through-the-heart corpse in it…well, I guess you know how wonderfully this turns out, kiddies! In TOD 3 & 4, new writer Archie Goodwin would introduce Rachel Van Helsing, who would save Frank from a remorse-driven suicide, and Gardner Fox would pen “marking time” issues 5 & 6, but these were mere preludes to the symphony of horror that was about to begin. 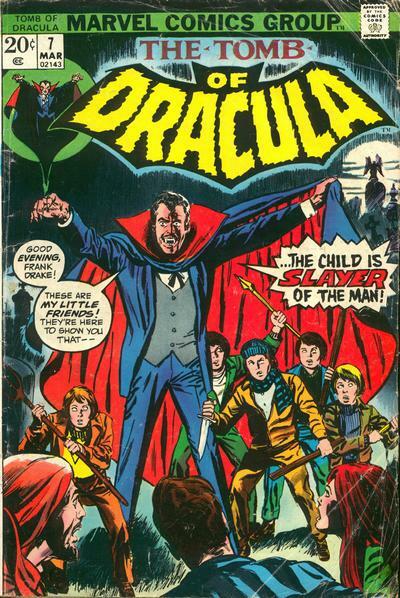 Marvel Editor-in-Chief Roy Thomas hired the aptly-named Marv Wolfman to take over the series with the March 1973 7th issue of Tomb of Dracula, a position he would hold until the #70 series finale, despite the fact he “didn’t like vampires, and had never seen a vampire or Dracula movie, including the Bela Lugosi original.” (From Alter Ego #113’s Richard Arndt interview with Marv Wolfman) What Mr. Wolfman did was to re-visit the Bram Stoker book, and using that novel as a template, told character-driven stories of great atmosphere, depth, and emotion centered around Dracula, but focusing on his supporting cast as well as newly introduced antagonists. The first addition to the cast of characters was unveiled in Issue #7; Quincy Harker, confined to a wheelchair after an attack by Dracula that would also claim the life of his wife, and who has now taken up the hunt for the Lord of Vampires along with his mute servant, Taj. Harker would soon enlist Frank Drake and Rachel Van Helsing, whom he had trained to be a “slayer” as a child (an antecedent to Buffy, perhaps?) in this quest to rid the world of the curse of nosferatu. Following quickly in #10 was the debut of Blade, the Vampire Hunter, who used wooden knives to dispatch the undead, and whose appearances over the next year would lead to solo outings, and eventually, multiple starring series in the 1990’s that begat the films…and Wesley Snipes’ tax problems! Throughout the 6-year Wolfman/Colan run, Dracula was the epitome of evil, yet always with a sense of dark nobility, much like Doctor Doom. On more than one occasion, Dracula would find himself on the “side of the angels” against some greater threat, and in those moments, the reader would begin to feel some sympathy toward this un-sympathetic monster– not an easy task, considering. 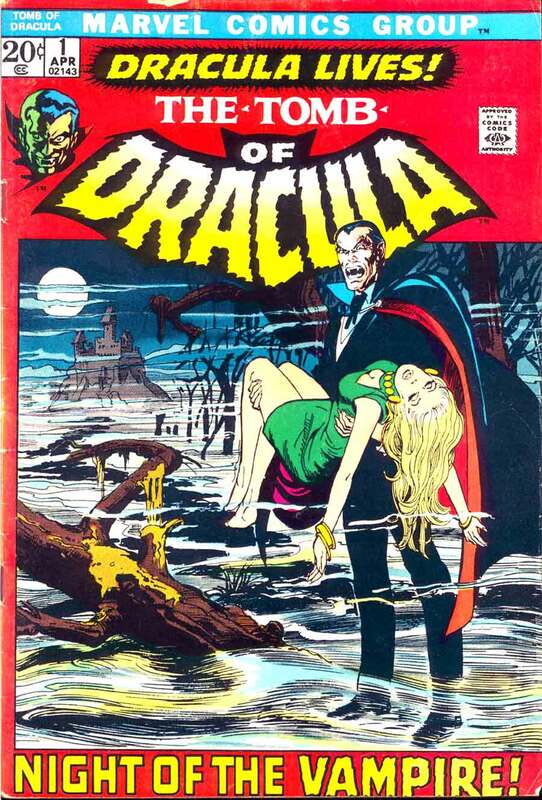 Thankfully, the entire run of Tomb of Dracula has been reprinted in three Omnibus volumes that also collect the follow-up magazine run, and the various Giant Size issues and cross-overs such as Dr. Strange #14, although I’ve had an urge for some years now to purchase the “Essentials” editions of the series, just so as to see the artwork in black & white. 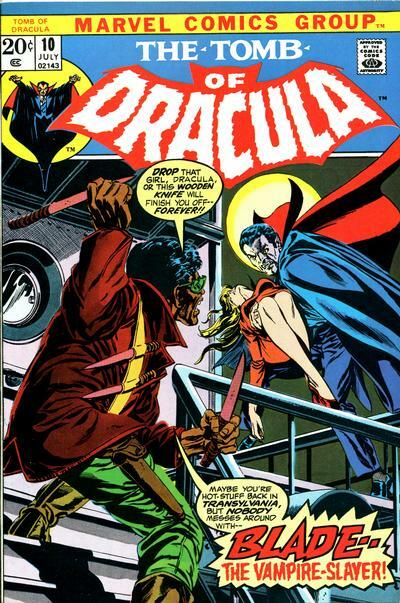 In whatever form, however, Tomb of Dracula is the most outstanding example of non-anthology, serialized horror in comics history, and certainly the best sustained use of a villain as lead character as well. For this Halloween season, give yourself a “Treat”, and dig up some Tomb of Dracula. Soundtrack: This article was composed whilst listening to “Swan Lake”, which was used as the thematic music for the 1931 Universal “Dracula”.